Answering a call of the Palestinian civil society, the Front in Defense of the Palestinian People of São Paulo and the Palestinian Front in the University of São Paulo celebrated in September 20, at the Students Hall in the Law School of University of São Paulo, a meeting inaugurating the national campaign for BDS (Boycott, Disinvestment, Sanctions) against the apartheid policy of Israel. Print-out information on the campaign, including the Stop the Wall Report on military relations between Brazil and Israel (translated to Portuguese) and public declarations of many political entities of Brazilian society, were distributed to the near 100 people present to the act. Arab and Palestinian committees and cultural centers of several Brazilian States sent messages supporting the campaign. The Palestinian Committee for BDS and Stop the Wall organization also sent messages. Initiatives for BDS in São Paulo will, hence, be coordinated with the Global Committee. At the opening it was explained to the public that this campaign is an effective and concrete form of defense of the Palestinian people issued from Brazil. At the meeting table delivered speeches the MST (Landless Rural Workers Movement), CSP-Conlutas (Popular and Union Central - National Coordination of Action), CUT (Unified Central of Workers), Women World March, Women Action Movement, São Paulo Metro Workers Union, PSTU (Unified Socialist Workers Party), PCB (Brazilian Communist Party), MOPAT (Palestine for All Movement), UNI (Islamic National Entities Union), ASSIP (Islamic Association of São Paulo), Islamic Young League in Brazil, Anel (Free Assembly of Brazilian Students), PSOL-SP (Socialism and Liberty Party – Member of Parliament Ivan Valente representative), Revolutas and others, besides the members of the two Fronts that called the meeting. Alexandre Bento, of CUT, and João Zafalão, of CSP-Conlutas, declared that they intend to deal with Workers Unions in order to organize actions and promote the campaign in industries related to Israel, such as Taurus, (handguns manufacturer in the city of Porto Alegre) and EMBRAER (Aeronautics Brazilian Industry, in the city of São José dos Campos). The last one has multi million dollars business with Israel (Elbit Systems) for upgrading the airplanes of Brazilian Air Force. Taurus became the manufacturer of Tavor-21, an Israeli rifle presented at LAAD (Latin America Defense and Security Fair, yearly promoted by the Brazilian Government in Rio, with participation of many Israeli industries). This event helps industries involved in violations of international law to obtain profits with the complicity of Brazilian Government. Denounces are in a report from Stop the Wall movement. The Palestinian call started in 2005, when it was asked that countries set a military embargo against Israel until they accomplish the end of military occupation and colonization of Palestine lands; the removal of the wall in West Bank that, since 2002, divides lands and families, impeaching the rights of movement; the recognition of Palestine citizens rights of self-determination, sovereignty and equality; the respect for the right of return of Palestinians to their land from which they were expelled since 1948, when the state of Israel was unilaterally created. Main campaign of solidarity to the Palestinian people and against any form of discrimination in these lands, the BDS movement resulted in important conquests in other parts of the world, such as the rupture of millionaire contracts with builders of the illegal wall and settlements. In spite of worldwide success, this campaign in Brazil faces setbacks with the adhesion of the country to TLC - Mercosul-Israel Treaty - and bilateral deals with the occupant power, including military agreements. The Stop the Wall documents denounces that this treaty involves products made in illegal settlements in West Bank and products used in attacks against Palestinians. Also as a setback, Elbit Systems, Israeli manufacturer of unmanned vehicles and planes used against Gaza, is settling premises in Porto Alegre, capital city of the state of Rio Grande do Sul. It is one of twelve companies involved in the construction of the apartheid wall. Besides that, universities in both countries have celebrated cooperation and interchange agreements. Facing this scenario and answering the plea of the Palestinian people, in starting this campaign, the Palestinian People Defense Front of São Paulo and the Palestinian Front of the University of São Paulo enthusiastically ask the Brazilian government, as well as Brazilian public and private companies to impose a military and economic embargo against Israel, denouncing agreements and contracts related to acquisition of products and services involved in violation of the rights of the Palestinian people and occupation of their lands. “The BDS campaign against Israel represents the force of civil initiatives raising in importance every day worldwide! We need to denounce to the world the real face of Israel so that all will boycott that nazionist state! We hope that this campaign be impacting and give us force for the struggle that will end only when our beloved Palestine be free! Feel embraced by the comrades of the Sta. Catarina State Committee of Solidarity to the Palestinian People and by the Palestinian People! Long life to the Free Palestine! 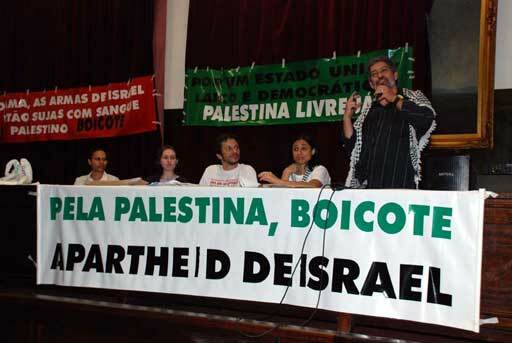 “The Rio de Janeiro State Committee of Solidarity to the Palestinian People congratulate the Palestinian People Defense Front of São Paulo and the Palestinian Front of the University of São Paulo for the initiative to launch the Boycott Israel National Campaign. We reaffirm our promise to amplify the campaign in our state. We wish success in this struggle, we are together.